"Jin-yu" redirects here. For the last remaining speaker of the Pazeh language of Taiwan, see Pan Jin-yu. Until the 1980s, Jin dialects were universally included within Mandarin Chinese. In 1985, however, Li Rong proposed that Jin should be considered a separate top-level dialect group, similar to Yue or Wu. His main criterion was that Jin dialects had preserved the entering tone as a separate category, still marked with a glottal stop as in the Wu dialects, but distinct in this respect from most other Mandarin dialects. Use of the entering tone as a diagnostic feature is inconsistent with the way that all other Chinese dialect groups have been delineated based on the reflexes of the Middle Chinese voiced initials. Certain other Mandarin dialects also preserve the glottal stop, especially the Jianghuai dialects, and so far, no linguist has claimed that these dialects should also be split from Mandarin. The main dialect areas of Jin in China. spoken in central Shanxi (the ancient Bing Province), including Taiyuan. spoken in western Shanxi (including Lüliang) and northern Shaanxi. spoken in the area of Changzhi (ancient Shangdang) in southeastern Shanxi. spoken in parts of northern Shanxi (including Wutai County) and central Inner Mongolia. spoken in parts of northern Shanxi and central Inner Mongolia, including Baotou. 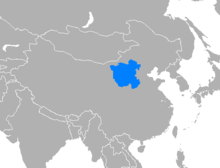 spoken in Zhangjiakou in northwestern Hebei and parts of central Inner Mongolia, including Hohhot. spoken in southeastern Shanxi, southern Hebei (including Handan) and northern Henan (including Xinxiang). spoken in Zhidan County and Yanchuan County in northern Shaanxi. Tone sandhi rules depend on the grammatical structure of the words being put together. Hence, an adjective–noun compound may go through different sets of changes compared to a verb–object compound. There are tones that merge when words are pronounced alone, but behave differently (and hence are differentiated) during tone sandhi. 入鬼 "fool around" < 鬼 "ghost, devil"
/pəʔ ləŋ/ < 蹦 pəŋ "hop"
/tʰəʔ luɤ/ < 拖 tʰuɤ "drag"
/kuəʔ la/ < 刮 kua "scrape"
/xəʔ lɒ̃/ < 巷 xɒ̃ "street"
A similar process can in fact be found in most Mandarin dialects (e.g. 窟窿 kulong < 孔 kong), but it is especially common in Jin. This may be a kind of reservation for double-initials in Old Chinese. For example, the character 孔 (pronounced /kʰoːŋ/ in Mandarin) which appears more often as 窟窿 /kʰuəʔ luŋ/ in Jin, had the pronunciation like /kʰloːŋ/ in Old Chinese. ^ CASS 2012, p. 3. ^ Yan 2006, pp. 60–61, 67–69. ^ Kurpaska 2010, pp. 74–75. ^ Kurpaska 2010, p. 68.